The High Pamir and Pamir-Alai mountains of Tajikistan and Kyrgyzstan form one of the world’s most remote and beautiful landscapes. But this seclusion and dramatic scenery are joined by extreme climate, and socio-economic isolation that results in communities here being some of the poorest in Central Asia. At an elevation of 3,500 meters, Kyrgyzstan’s Alai Valley faces long bitter winters that cut off roads to the valley for more than half of the year. The summer is a brief seasonal window when local farmers can grow their crops. 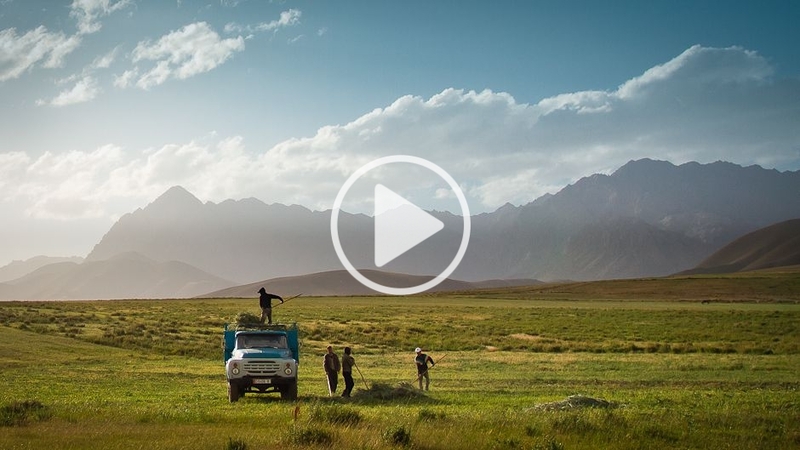 Following independence from Soviet-era top-down governance, collective farms, and jobs in livestock breeding, Alai Valley villagers have struggled to regain traditional agricultural knowledge. They have continued to rely largely on raising animals, a practice that has magnified land degradation and negatively impacted pasture ecology. Because of the climate, agriculture in these villages is limited to a few hardy crops, primarily hay and barley used to feed animal herds, and low-income subsistence options such as potato. Yet these crops too are vulnerable: one lost harvest from frost can spell financial disaster for farmers and even in the best of seasons income from agriculture remains low. Farmers in this region rarely have enough money to risk investing in new crops that might improve their economic situation. But the ingenuity of some local farmers who are interested in expanding beyond the confines of traditional staple crops, is leading an agricultural transition towards micro-innovation. Buunisa Termechikova is one of the farmers in southwest Kyrgyzstan’s Chon-Alai Region who is contributing to this shift. Her enthusiasm began with her in-home “greenhouse”. Buunisa and her husband Baratbai Tashkulov have also dedicated a small outdoor plot of land to experimenting with new crops such as garlic and dill. The results were promising and hopes are high, because crops like garlic can be sold at prices three times that of potatoes. However, farmers like Buunisa and Baratbai can face difficulty in scaling up new crops without a safety net of community support, targeted technical assistance, and the connections necessary to enter a new market. This is where the Sustainable Land Management in the High Pamir and Pamir-Alai Mountains (PALM) project steps in. PALM is an integrated transboundary initiative of the governments of Kyrgyzstan and Tajikistan (conducted in partnership with the United Nations University Institute for Environment and Human Security — UNU-EHS) that is addressing the interconnections between land degradation and poverty within a region that is one of Central Asia’s crucial sources of fresh water and a location of biodiversity hotspots. In an innovative approach to encouraging new forms of agriculture, PALM is supporting a variety of pioneering micro-projects proposed by Alai Valley farming communities. One such micro-project is a community garlic-growing group co-organised by Buunisa, Baratbai and other neighbouring farmers. By providing key capacity-building for projects that have been initiated by community groups, the PALM project is triggering adoption of sustainable agriculture through example and encouraging a tendency towards collective action and knowledge exchange. UNU team in the garlic fields. Photo: Luis Patron / UNU. PALM does not support individual initiatives, nor is it the project’s goal to encourage communities to focus on one particular crop such as garlic. This could drive the economic benefits down and create a new situation of monoculture dependence. Through a micro-project focus, PALM is instead working to nurture community-led innovation and demonstrate that trying new methods can have a number of short- and long-term benefits. Assessing those benefits and impacts is one of the key roles of the UNU team, with the goal of exchanging lessons learned with other sustainable land planning initiatives. On a macro scale, the governments of Tajikistan and Kyrgyzstan are already discussing the proposed adoption of the PALM Strategy and Action Plan for other mountain territories. Regarding long-term impact, Pachova says that the team is “also working on making legal, policy and strategic planning changes at higher levels of decision-making that will enable improved conditions for sustainable development of the region in the long-run”. For farmers like Buunisa and Baratbai, however, the short and long-term impacts are closer to home. Their farm’s new agricultural diversity is providing a steady supply of nutrients formerly missing from their regular diets and Baratbai hopes “that our children and grandchildren will continue this work in the future. If garlic and onion cultivation is continued, as we are doing now, then, God willing, our children and the local youth will prosper”. The Chon-Alai micro-projects were supported by the Sustainable Land Management in the High Pamir and Pamir-Alai Mountains (PALM) project. PALM is executed by the Committee on Environmental Protection in Tajikistan and the National Center for Mountain Regions Development in Kyrgyzstan, with financial support from the Global Environment Facility and other donors. The United Nations Environment Programme is the Implementing Agency and the United Nations University is the International Executing Agency. For an overview of findings from the PALM project please download the UNU Policy Brief, ‘Towards sustainable land management in the Pamir-Alai mountains‘. Innovative crops of the Alai Valley by Daniel Powell is licensed under a Creative Commons Attribution-NonCommercial-ShareAlike 3.0 Unported License.